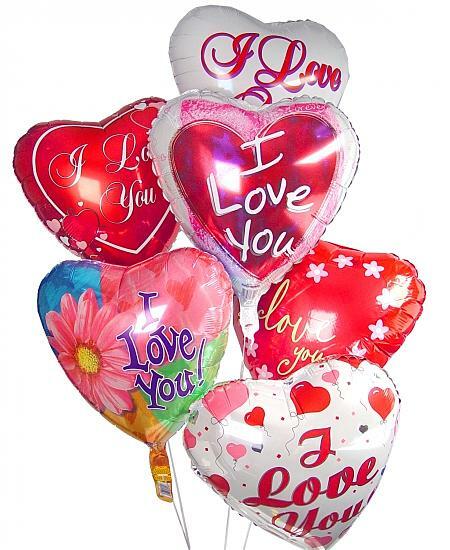 Shiny metallic balloons on Valentine's Day are a popular way to express one's love toward another human being. Ah, Valentine’s Day. Is there a less meaningful or more detestable holiday on the calendar? Surely designed to stroke the fragile egos of insecure lovers while shamelessly bilking them to the tune of hundreds of millions of dollars, Valentine’s Day is yet another burden on those of us who struggle to remember — or pretend to care about — our significant others’ birthdays and anniversaries. This so-called day of love serves only to pressure us, particularly guys, to open our wallets and not our hearts or minds to win the affection of the women who claim to love unconditionally. If we learn anything from Valentine’s Day, it is that unconditional love can be bought with prickly red roses, rich fattening chocolates, insincere remarks printed on greeting cards concocted by a recent English Literature graduate, shiny mylar balloons, and an expensive night out at a trendy restaurant. More severe situations result in being conned into purchasing diamond pendants, bracelets and earrings. Nothing says “Be My Valentine” quite like presenting your lady friend with a piece of jewelry that features a diamond plucked from a treacherous mine in Botswana by a 9-year-old orphan. 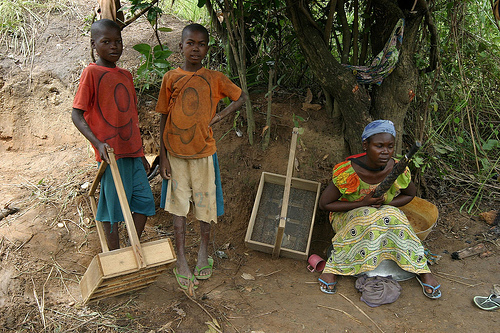 Diamond diggers like these make it possible for Western men to buy the affection of the women they desire on Valentine's Day. Make no mistake, guys — the cards are stacked against us. Ad agencies and marketing departments across the nation delight in heightening the expectations among American women, planting the evil seeds of hope that they will be treated like a princess on February 14th. We are bombarded by peddlers of scrap and junk, including Zales, Kay Jewelers, Jared (not the Subway sandwich guy, but the dude that implores us to ‘buy your gal some jewelry, or else’), and DeBeers — the villainous masterminds of the propaganda campaign telling us we must spend two months’ salary on a diamond ring. And you wonder why unemployment rates are so high. After all, it’s not a terrible alternative to morphing sixty days’ pay into a shiny band symbolically wrapped tightly around your girlfriend’s finger. We find ourselves directly in the center of their crosshairs during commercial breaks of football games, basketball games, Sports Center, and Desperate Housewives. There is no escape. 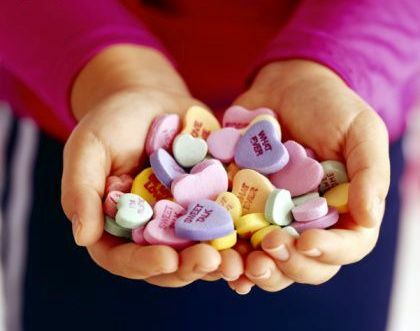 She loves me, she loves me not: The amount of love one has for another can be measured precisely by the amount of candy hearts enclosed in Valentine's Day cards. From an early age, we are conditioned to believe this behavior is normal and acceptable. We were taught to prepare cartoon-themed Valentine’s Day cards for our grade school classmates. For the objects of our childhood crushes, we enclosed extra candy hearts to show just how much we liked them. Instead of explicitly saying “I like you,” we learn that it is much easier to imply the sentiment through copious amounts of sweets. Later in life, we trade the crafts of confectioneries for precious elements. Afraid of rejection, we hedge our bets that Susie Q. Prettypants will accept the offer to “Be Mine” when presented gold, platinum, and/or diamonds. It’s not as easy to say “no” to the beer belly, receding hair line, flatulence, and stray hairs on the ears and back when the deal is sweetened with valuable metals and stones. The time has come to rise up and thumb our nose in the face of tradition. It’s time to peel the layers back to reveal the rotten core of St. Valentine’s Day and take a stand. No more Mr. Nice Guys. Valentine’s Day Sit Outs: Spinning off of the famous Sit Ins during the Civil Rights movement, the first thing we can do is to simply refuse to take part in the Valentine’s Day charade. No special dinner, no chocolates, no roses, and sure as hell no jewelry. Order pizza. Watch a game. If no decent sporting events are available, watch that shoot-em-up movie you’ve been wanting to watch. For the audacious, demand that she cook you a special dinner. Kill the mood: Suckered into a romantic night at the best restaurant in town? Reluctant to spend Valentine’s Day with dozens of lovey-dovey couples? Ruin the night for yourself and everyone else by starting a lovers’ quarrel in a quiet eatery. Escalate into a screaming match, if possible, and be sure to stay on message by elaborating — loudly, with expletives — why you believe this to be a bogus holiday. At best, you just might gain support from fellow male diners and provide the spark that is needed to set the Valentine’s Day tradition ablaze once and for all. At worst, you exhibit steadfast adherence to principle — a quality that all women love (just maybe not the one you have embarrassed at dinner). Burst the bubble: Carry a pin, needle or tack and pop every red, white, silver, and heart-shaped balloon you encounter. Poison the well: Flowers are ubiquitous on Valentine’s Day. Say goodbye to flower power by pouring a little weed killer into the vase and revel in the symbolic wilting of false pretense. No access to weed killer? No problem. Conjure the spirit of high school dances and spike the vase with a little vodka or grain alcohol to wipe out the weeping white roses. Save a celebratory victory shot for yourself. These are just a few ideas to spur some creative ways to express dissatisfaction of the current status quo. In closing, I implore one and all to stand up and join me in a Valentine’s Day Sit Out. Do it for her, do it for us, and most importantly, do it for yourself. You deserve it. This entry was posted in Lifestyle and tagged balloons, candy, cards, Day, diamond, jewelry, St. Valentine, Valentine, Valentines by Troy Beckman. Bookmark the permalink.